A single tooth implant and a crown can replace one missing tooth. The dental implant works like the lost natural tooth root. The crown will replace the visible part of your lost tooth. Let’s say you want to replace a front tooth due to an injury, caries or periodontal disease. In this case a tooth implant woks better than a bridge because neighbouring healthy teeth won’t be reshaped to support the bridgework. For the same reason, one tooth implant can replace a molar either in the upper or lower jaw. The main requirement for a tooth implant success is the quantity and quality of your jawbone. If you lost your tooth because of injury or caries, usually the bone tissue is enough to hold the implant. The situation is different in case you lost it because of periodontal disease. This pathology tends to destroy the hard tissue that is the natural support for all dental elements. If that happened additional bone needs to be added. The procedure to do that is called bone augmentation or bone graft. If there is not enough bone height in the upper jaw or sinuses are too close to the jaw, you may require a sinus lift. Even your gums have to be in good health. After the tooth implant procedure, gums must surround the base of the new crown. This in order to get the most high aesthetic result. Generally, dental implants consist in 3 main parts and are made of different materials. Also known as fixture or screw is made of titanium, porcelain or zirconia. The dentist places it in the upper or lower jawbone beneath the gum line. It can be made of titanium, gold or porcelain. It is attached to the fixture with a screw. The abutment connects the fixture to the prosthesis. In some cases abutment and fixture are a unique piece. In this case it is a crown. You can choose from different materials: multi-layer resin, porcelain fused to metal (PFM), full porcelain or zirconia. The more aesthetic the crown is the more expensive the tooth implant cost will be. The crown is connected to the abutment with dental cement or a screw. If your periodontist will use a screw, the hole will be covered with tooth-colored material so it will be invisible. Before to start any work, your dentist needs to know your medical and dental history. In particular you should let your doctor know if you suffer from diseases like: diabetes, or osteoporosis. Next you will get a full examination of your mouth. The technician will take X-rays and impressions of your teeth and jawbone (upper and lower). Dental impressions are the base to create a plaster model of your mouth bones and teeth if any. X-Rays are not so accurate, they give the doctor an overall indication. In order to plan the tooth implant procedure a computed tomography (CT) or a 3D Cone Beam Dentalscan (CBCT) is more appropriate. This 3D imaging shows your dentist how much jawbone is available to hold the implants in place. It also will show the position of nerves and sinuses so they can be avoided during surgery. 3D Cone Beam Dentalscan (CBCT) is also the base for computer guided implant surgery and all-on-four procedure to replace all your teeth. After these exams, the dentist or periodontist is ready to discuss with you the treatment options. One day tooth implant procedure. When radiology exams show you have the required bone quantity and quality, insertion and loading will be done in one appointment only. The dentist gives you the local anesthesia to numb the part of your mouth to be treated. 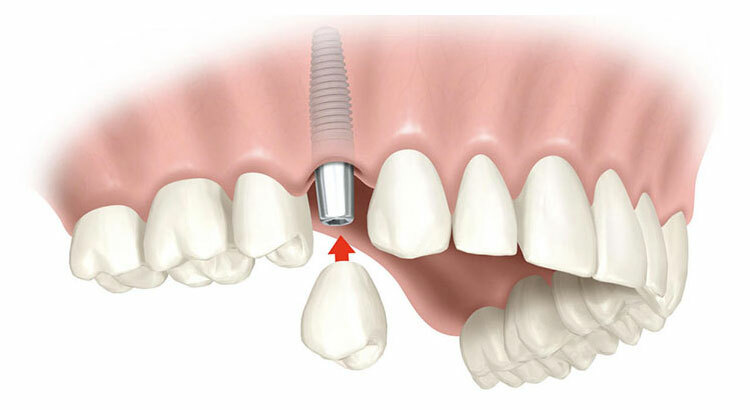 If the natural root is still in place, it will be removed and the implant inserted after extraction. Your doctor can evaluate the primary stability of the implant by a manual or computed tool. When that stability is enough, the abutment is connected to the fixture. The last step is to screw or cement the crown on top the abutment. Once the bite of your upper and lower jaw is adjusted, you can leave the dental office with your new tooth implant in place. The procedure is longer if the starting fixture stability is not enough to support the chewing forces. In this situation two appointments are required to accomplish the result. During the first procedure, the dentist cuts the gum where the implant has to be placed. A small hole in the bone is done using a drill. The implant is put in place and the cut closed with stitches. Over the next two to six months, the implant and the bone bond together and become as one unique piece. The bonding process is called “osseointegration”. in the bonding period, your dentist will not leave you without tooth. There are a few temporary tooth replacement options available: for example a maryland dental bridge can be placed over the implant spot. At the end of the healing time, the second stage begins. The dentist makes a new incision to expose the implant. A healing cap, is screwed onto top the implant. This will help the gum tissue to reshape and heal properly. One or two weeks are enough. Once gums are ready your implant dentistry specialist replaces the healing cup with an abutment. Now the structure is ready to get the crown in place. Sometimes the permanent prosthesis is screwed or cemented after wearing a temporary crown for a short period. The temporary crown will be in place for two to three weeks. Its scope is to let gums to heal around it. At the end they will look like normal gums around natural teeth. The tooth implant cost, in this case, will be higher. 2 or more appointments are required instead of one only. The final price increases if a temporary crown is used and the permanent one will be made of expensive material. Bone augmentation before dental implant surgery. X-rays, may show your dentist you don’t have the right bone quantity to support an implant. In this situation you can still replace your missing tooth with a single implant but a middle procedure is needed. Before to place the titanium fixture, the oral surgeon has to do the bone graft or sinus lift. Dental implants are not free of risks and complications due to the surgery and additional causes listed below. Osseointegration is the process that integrates the dental implant with the jawbone. If it doesn’t happen the fixture cannot support the abutment and the crown. In a few words: the dental implant fails. The effect of stress on the implant because of imperfect occlusion. Bad primary stability because of poor bone density. Too much pressure on the structure because of teeth grinding or chew forces. Poor stability because of the implant insertion in an inadequate extraction socket. In all these failure cases, the dentist has to remove the tooth implant. Before to put another one in the same place, the oral surgeon has to clean the socket and wait for the recovery period. It is not the same amount of time for all people. Tooth implant infection can always happen. The most common reason is bacteria coming from plaque not properly removed with the dental hygiene. Bad guys cannot attack the natural tooth root because it is not there anymore. They follow the implant to reach the bone and infect it. Before implant surgery, you dentist will prescribe you antibiotics. You should continue to take them for 3 or 5 days after the procedure. In the long term, you should keep your teeth as clean as possible to avoid plaque to grow, bacteria to penetrate and implant to fail. An additional tooth implant complication is the lower jaw nerve damage. All people have a nerve that runs through the mandible (lower alveolar nerve). If the oral surgeon doesn’t pay enough attention it can be damaged by drilling the bone or placing the implant. This can cause numbness (paresthesia) of the lower lip, chin or a tongue side. This complication can be temporary or permanent. Before to replace lower teeth with dental implants, a computed tomography (CT) or a 3D Cone Beam Dentalscan (CBCT) is taken. This can help the dentist to locate the nerve position and minimize the connected risk. If in the lower jaw your oral surgeon has to pay attention to the mandibular nerve, in the lower one the risk is to perforate the sinuses located above your upper teeth. Even nasal cavities are at risk too. As mentioned above 3D x-rays can help the dentist to locate them in order to avoid potential damages. Thinking of implant alternatives, bridgework can be one of them. Browsing forum and chat, you can discover many people asking questions about these two dental devices. The concept at the base of implants is completely different than that at the base of bridges. A tooth implant replaces the dental root and supports the crown that works as the natural crown. No other parts of the mouth or teeth are touched. With dental bridge, instead, the support is coming from adjacent teeth. Before to cement the bridge on nearby dental elements, the dentist has to ground them down. So the first advantage of the single implant over the bridge is that the first doesn’t depend on the others. When a tooth is removed, the surrounding bone begins to reabsorb because not stimulated. The implant fixture, instead, is screwed within the bone. In other words, implants stimulate the jawbone that doesn’t reabsorb. A single implant can be easier to keep clean than a bridge. You can treat the tooth implant exactly like a natural tooth. You can brush and floss it like all other dental elements in your mouth. With bridges it is not so simple. Often you can see receding gums in the bridge area because of plaque the patient cannot easily remove. The subsequences are gum disease and bone loss.